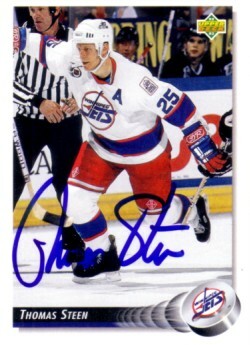 1992-93 Upper Deck card autographed in blue by former Swedish National Team and Winnipeg Jets star Thomas Steen. ONLY ONE AVAILABLE FOR SALE. Obtained in person, with certificate of authenticity from AutographsForSale.com.